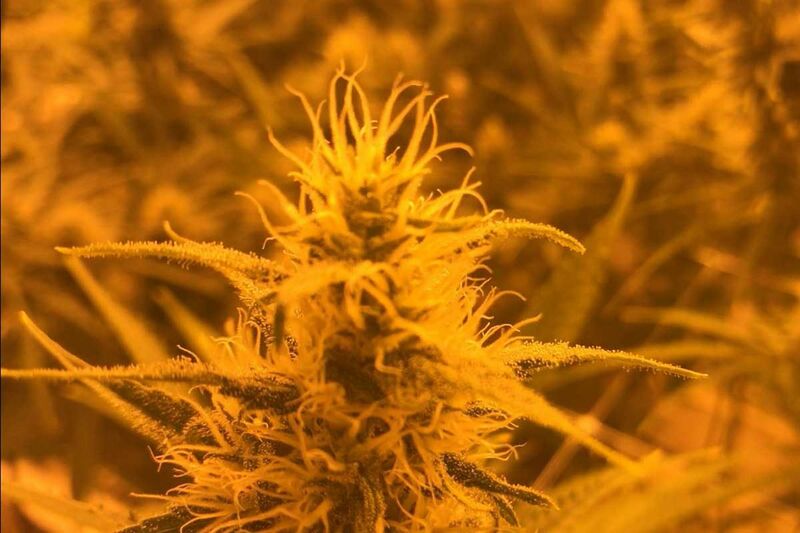 Marijuana growing under lights in a warehouse facility. Dispensaries across the state began to sell medical marijuana program in mid-February. But two months after the launch, there are no operational dispensaries in Philadelphia. More than two months after Pennsylvania's medical marijuana growers harvested their first crops, Philadelphia still lacks an operational dispensary. The state granted permits last year to five retailers to sell legal cannabis in the city. But lawsuits, protests, and construction issues — as well as concerns about the number of registered patients — have delayed their openings. Although three dispensaries have opened in the suburbs, Philadelphia won't get its first retailer until late May, when Restore Integrative Wellness is scheduled to open in Fishtown. Neighborhood opposition derailed two of the retailers — one that had been planned near Philadelphia Mills in Northeast Philadelphia and another inside a former bank in East Mount Airy. Pharmacann pulled the plug on opening next to Philadelphia Mills, near I-95. The shopping center had filed suit in federal court, claiming that deed restrictions on the $1.1 million property banned a "drug store" from occupying the property. The case was set to become a flashpoint in the clash between federal law, which outlaws all cannabis, and medicinal marijuana programs operating in 29 states and the District of Columbia. Pharmacann surrendered on March 27 rather than run the risk of setting a precedent that would have imperiled the programs. It will relocate the shop to northwestern Bucks County, said Pharmacann lawyer Jeremy Unruh. "We've elected to sell the property," said Unruh. "We were on the right side of this dispute, but undertaking the fight would have been a major lift in terms of time and resources." Pharmacann wasn't the first to wave the white flag. TerraVida Holistic Centers retreated from East Mount Airy after local politicians rallied with church groups to challenge its zoning permit, saying the dispensary was illegally sited within 500 feet of an unlicensed day-care center. Co-owner Chris Visco scoured the city for a new site. "There was nowhere to go," Visco said. The Department of Health granted permission for TerraVida to relocate the East Mount Airy shop to a former auto parts store in Malvern. "Zoning makes it nearly impossible to find viable sites in Philadelphia," said lawyer Andrew Sacks, who co-chairs the Pennsylvania Bar Association's committee on medical marijuana. Few available storefronts are outside the required setbacks from schools and child-care centers. After City Council appealed the original 1,000-foot setback, the Department of Health granted the city a 500-foot variance. But day-care centers are so common that most residential and business areas are still no-go zones. Sacks is trying to get the setback reduced to one foot from any child-care facility. "No 18-month-old child is going to crave medical marijuana," Sacks said. But he's not getting buy-in on the idea from local politicians. "Right now, we have nothing moving with City Council." In Fishtown, Steve O is preparing to open Restore Integrative Wellness on Frankford Ave. He had planned to launch in early April, but was delayed by construction issues and hold-ups in city permitting. "Usually, you'd need a year to build all this out," O said. "The initial state regulations gave us six months. The window has been pretty heroic." O is waiting for the Water Department to test the lines for a sprinkler system. Until the fire-suppression system is approved, O can't get his certificate of occupancy. "I can still guarantee that we'll be the first to open in Philadelphia sometime next month," O said. In South Philadelphia, Keystone Shops has a building on the 300 block of Packer Avenue slated for a dispensary. They're taking their time, said Skip Shuda, chief operating officer. He said the company has focused on its other two sites, in Devon and King of Prussia. Shuda said the South Philadelphia store would open in late summer. In Bustleton, Holistic Pharma has held back the dispensary launch at Krewstown Road and Bloomfield Avenue to wait for the medical marijuana market to mature, said Keith Morgan, Holistic's director of operations. The company also owns a growing facility in the northwestern region of the state, where it expects to harvest its first crop in early May. "It didn't make sense to open if there weren't many patients or enough product," said Morgan. "Most of the dispensaries that did open in February ran out. We didn't want to disappoint anyone."